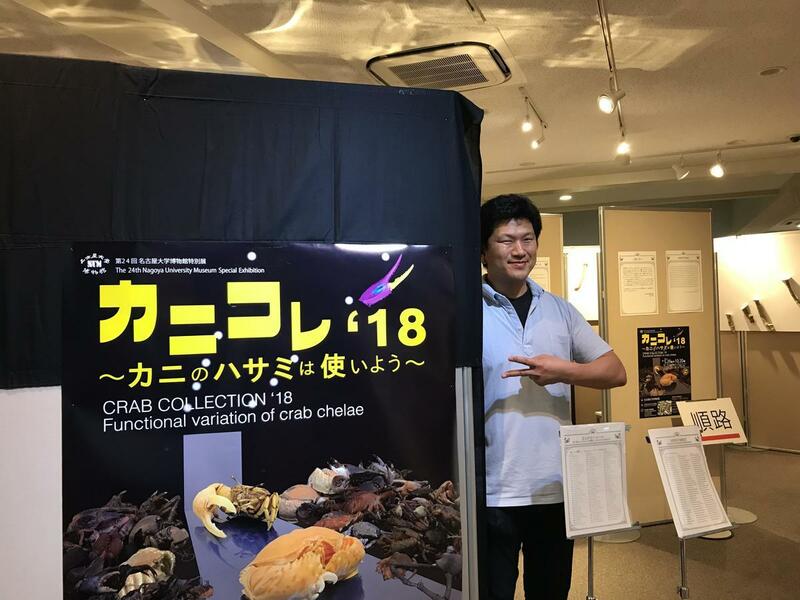 The Nagoya University Museum's new special exhibition, "Crab Collection '18: Functional variation of crab chelae," is full of playfulness -- from its name inspired by Paris Fashion Week (called "Paris Collection" in Japan), to the "Crab Election" where visitors can vote for their favorite crab. In fact, the content of the exhibition is the result of advanced research that reveals the variety in crab claw form and function, as well as the universality that lies within. When we hear the word museum, we often picture a silent space full of fossils or animal specimens. To say something is a "museum piece" is like calling it an antique, basically another way to say it's obsolete. Upon entering the backyard of the Nagoya University Museum, however, you see that it's not only a traditional collection of artifacts, but also indeed a dynamic space for knowledge. 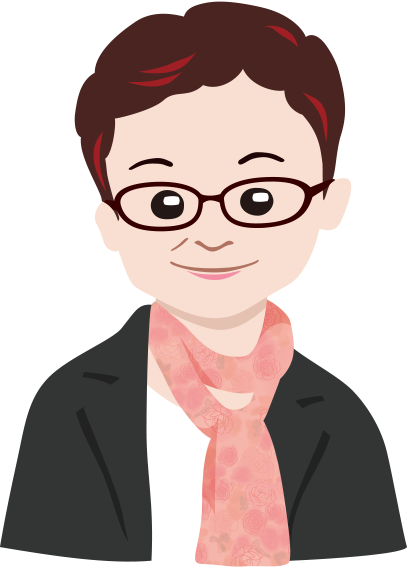 The museum is served by a small group of seven full-time teaching staff who engage in different kinds of research, from the origins of man, to mysterious spheres that roll around beaches, to the common dandelion. Upon first glance there seems to be no connection, but staff say that regular exchange with researchers from different fields reveals unexpected connections and developments. The Crab Collection also features one of those mysterious spheres. Exchange between different cultures is a major feature of the museum's research, and researchers agree that their work has been possible only in the museum. It is an advantage that the museum is in a university, as they have access to specialists and partners necessary to their research, and no shortage of interested students who will work for them. The results of their research are exhibited in the museum, which makes them different from other researchers at the university, but it's also a pleasure to have their work seen by so many people. It makes for a small but exciting and unique base for research. Lecturer Shin-ichi Fujiwara stands at the entrance of Crab Collection '18. In the poster, both the models who "crab walk" down the runway of the fashion show and the audience are crabs. Lecturer Shin-ichi Fujiwara is the head of the Crab Collection. He's an expert on the relationship between the musculoskeletal system and its function in animals. For example, from the shape of dinosaur bones, he surmises how they walked, or what posture they slept in. This includes crab claws, which have developed through changes in the tips of crab legs, and big advantage is that it's easy to collect specimens -- things like snow crab legs that he ate the meat inside are also subjects of his research. There's actually a large variation in crab types. Some have powerful claws so that they use to smash shells and bring them to their mouths, while others cleverly use their pointed claws to wrench open shells. There's left-handed crabs mixed in with right-handed crabs with large right claws. Sad to see is the male fiddler crab. His larger claw cannot reach his mouth, and he uses it only as a prop while he dances to attract a mate, or to hit opponents in a fight. "The female can easily use both claws to eat, but the male eats with just one smaller claw. Does he really want to attract a female so much despite the risk?" Fujiwara himself wonders. The fiddler crab has a kind of simple-minded air, so I gave him a vote for his unique personality in the Crab Election. 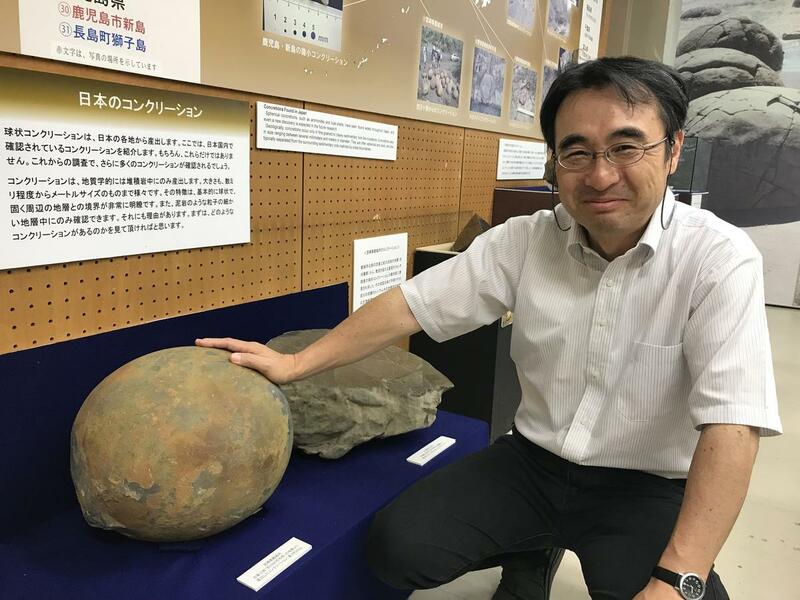 Professor Hidekazu Yoshida with a concretion discovered with in Miyakonojo City, Miyazaki Prefecture, from a layer stratum about 50 million years old. It weighs 40 kilograms. The mysterious sphere that was shown at the Crab Collection is called a concretion, and inside it contained a fossilized crab. There was a notice about a separate exhibition about concretions in another room. A mini version of last year's special exhibition "Mysterious spherical concretions -- Ultimate fossil preservation system" is now part of the permanent exhibition. As said in the exhibition title, concretions have a deep connection with fossils.